ABC was successful in surprising John Green with the 2014 Walter Mather Award in April at the London Market Reception which concluded the Spring Meeting in London. 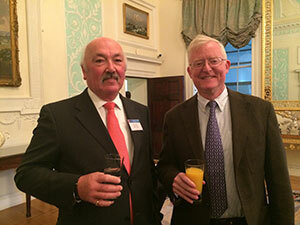 John, retired Lead Underwriter from ACE Global Markets Limited, was ABC's guest at the Reception held at Lloyd's of London on April 8. Rick Broderick, ABC President and ABC Awards Panel Chair, presented John with the crystal award that is bestowed annually. The award is given out to candidates who have greatly impacted ABC and John was involved with ABC for many years, having been the Lead Underwriter of the program at ACE, originally Ariel syndicate at Lloyd's. ABC and Cooper Gay & Co Ltd have been honored to work with John over the years and noted that he was instrumental in the success of the ABC program. The ABC leaders offered their best wishes to John in his retirement.